Nightlife in Kovalam revolves around the many bars and restaurants. Theres a variety of cuisines on offer. The beachfront is the place to enjoy cheap excellent food, and people watching! Theres a continual stream of holidaymakers from all around the world, locals, and vendors. Young boys playing wooden whistles, and swirling yo yos and other brightly lit trinkets, enticing you to buy their goods. Some bars have live music, just look out for flyers posted along the beachfront, or follow your ears! Away from the beach, restaurants are cheaper, and probably more relaxed. 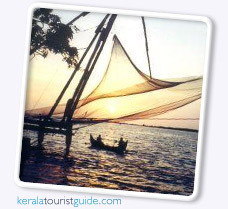 The Chinese fishing nets (Cheena vala) of Fort Kochi (Fort Cochin) in the City of Kochi (Cochin), in Kerala, are fixed land installations for an unusual form of fishing shore operated lift nets. Huge mechanical contrivances hold out horizontal nets of 20 m or more across. Each structure is at least 10 m high and comprises a cantilever with an outstretched net suspended over the sea and large stones suspended from ropes as counterweights at the other end. Each installation is operated by a team of up to six fishermen.